How would I know ? I’m just a man! 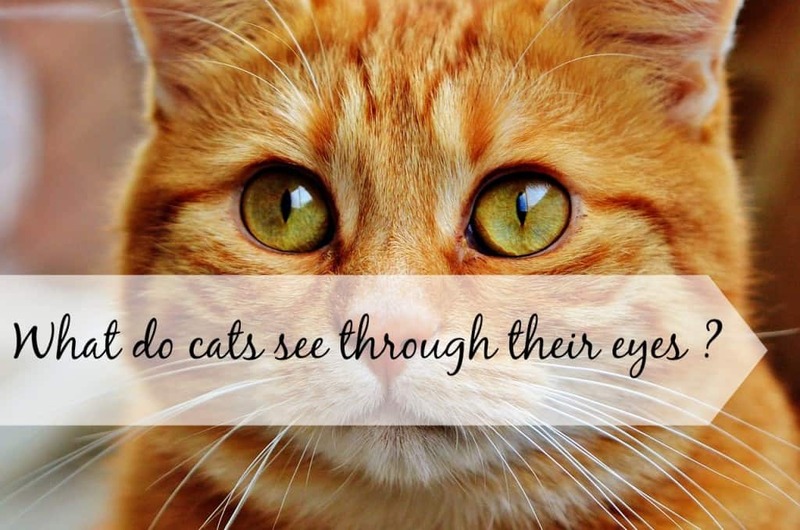 Well you are right, it is very difficult to know for sure what your feline friends can observe through those beautiful eyes. Nobody ever plugged their brain to a cat’s eyes. However, by studying a number of factors that we know determine vision, we can scientifically guess what cats can see through their eyes. Here is an explanation of what we already know about the two fairest stars of your tiny companion. Cats are creatures “designed” for the night. Their eyes contain an impressive number of light sensitive cells (rod cells) that enable them to see in the darkness. Not complete darkness of course but his night vision is incredibly better than ours for that matter: estimates say from 3 to 8 times better! This night vision is also reinforced by the size of a cat’s eyes in proportion to its head. Because they are bigger and cats can open them much wider than us, they only need one-sixth the amount of light as that of a human to see. Cat’s pupils have the ability to dilate 3 times larger than us and their cornea is also larger which enables them to let in more light. Another super power of your little friend is his extended visual field of 260 degrees. Compared to our little 220 degrees, that is an interesting improvement. This comes directly from the position of his eyes on his head; because it’s more up front, it gives him a larger area of binocular vision allowing him to have a better peripheral vision and a more accurate depth perception and consequently a better coordination of body movements. If you’ve ever observed how agile and precise your cat was when flying from the corner of the table to the top of your fridge, you understand that it is first and foremost because they have two brilliant captors enabling them to do so. On the other side, they cannot see anything less than a foot away, it’s physical. That’s when their little whiskers become very handy to help them identify what’s going on just in front of them. The cat’s retina has 10 times less “cones” than us humans. In English, that simply means that we function much better in bright light than they do and that we perceive a greater range of vibrant colors. This idea is reinforced by behavioral studies on cats: it appeared that they did not seem to see as wide of a range of colors as we humans do. In fact, they should only be able to perceive yellows and blues, making it impossible for them to distinguish greens or reds. Other experts believe cats’ color vision is limited to blues and grays… Hard to know exactly where the truth lies but most experts agree to say that cats perceive colors with less richness of hues and saturation of colors than us. One thing experts agree on, cats see the word in pastel colors ! A disadvantage you think ? No Sir! It is on the contrary a huge asset for your little hunter. Indeed, this enables him to be less distracted by colors and focus on his moving prey. While every single one of this parts play an important role in your cat’s vision, some are very specific to your cat and explain his amazing abilities to adapt to low light and hunt in the dark. 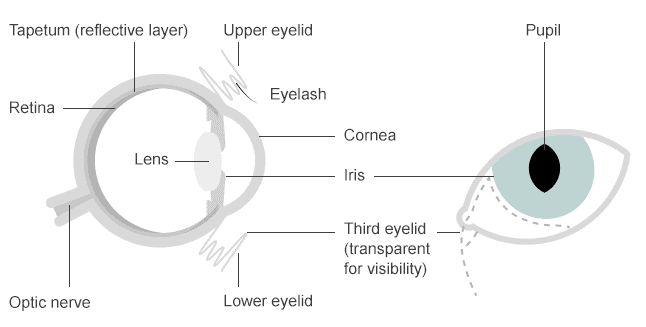 The pupil for example, is very singular for a mammal: its shape can go from a vertical slot in intensive light to completely round in darkness. It adapts incredibly to the amount of light of the environment. The retina has less cones (photoreceptor cells) than us: the cat thus perceives less colors. The tapetum is responsible for the glowing appearance of the eyes when light strikes them: it reflects the light and makes it go trough the retina a second time for increased night vision. Although it is difficult to be 100% certain of what your feline friends can see, more and more studies are being conducted to give you the opportunity to understand them better. Nickolay Lamm, a young New York artist even created a representation of cat’s vision compared to ours. After studying the topic closely with Dr. Kerry Ketring from the All Animal Eye Clinic, Dr. David Jr Haeussler from the Animal Eye Institute, and the ophthalmology group of the Veterinary Department of the University of Pennsylvania, Nickolay created a picture that represents what a cat can potentially see. See this little video for more details and fun facts about cats and animal vision. 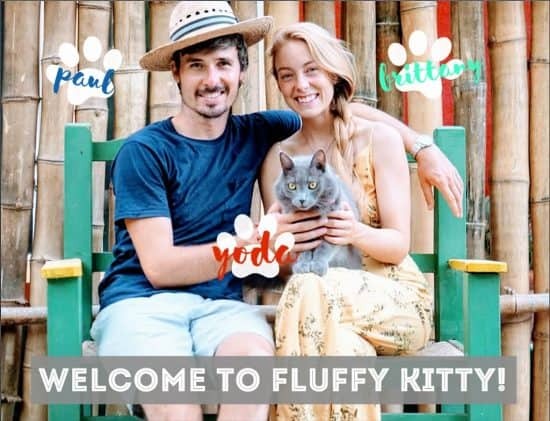 We hope you enjoyed this article and thank you for following us on Fluffy Kitty ! Do not forget to follow us on Twitter or Facebook or on your favorite social media. Stay in touch for more fun articles about your fluffy companion! Can Cats Cry When They Are Sad ?